Pam AGAIN!!!! She is on FIRE! She is on fire! Pam Diaz is GREEN!!! I feel like all we are doing is blogging about Pam but it is hard not to when she gives us so much reason to! There is a lot left unsaid but it is looking like Pam Diaz is going to be getting hooked up from Abec 11. We sure hope she does. 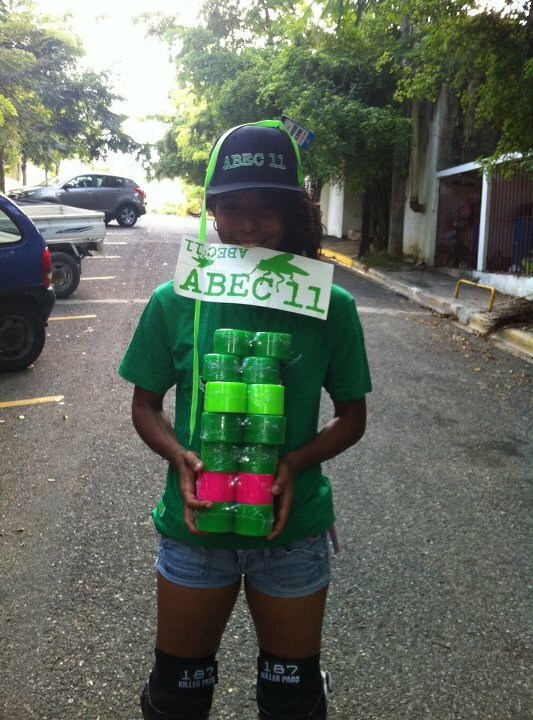 Abec 11 is smart to get her on board early. Pam is just one of those riders with natural talent. If you give her the tools she is going to build an empire; that is the type of rider and person that she is. We have watched Pam grow into the fine rider that she is today and when we see companies like Abec 11 getting in on her steeziness… it really brings a smile to our faces. Felicidades Amiga! You are killing it! Keep up the good work and you are bound to go far!!! This entry was posted in Uncategorized and tagged 187, abec 11, comet, daddies board shop, dbs, dominican republic, girl, girl skater, gnar, hot, oregon, portland, shred, skater, triple 8 by Spencer Morgan. Bookmark the permalink.